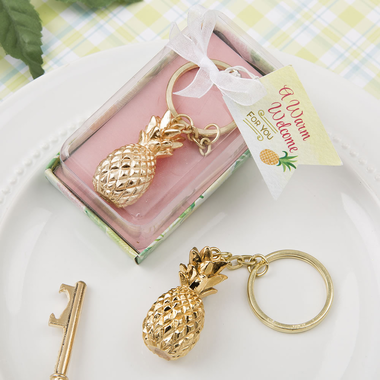 Add a prosperous glow to your next tropical-theme celebration with shiny pineapple party favors. Pineapples are a symbol for "Welcome", so they are perfect for a wedding, housewarming party, graduation, or any other event where you want your hospitality to be known. The delightful golden pineapple key chain has a gold-plated polyresin pineapple attached to a metal chain and ring. Packed in a plastic box with a clear plastic top, the charming little gift will immediately steal the hearts of your party guests. The size of the charm is 1 3/4" x 3/4". Add the key chain part and the length totals 3 1/2". Each key chain is packaged in a beautiful tropical themed clear topped box wrapped with a white organza ribbon and bow. A tag with a 'Warm Welcome For You' message is attached.